When I discuss corporate welfare, my first example is usually the Export-Import Bank. It galls me that taxpayers are coerced into subsidizing some of the world’s biggest corporations. And since I’m an economist, I also don’t like how these subsidies undermine the overall economy. 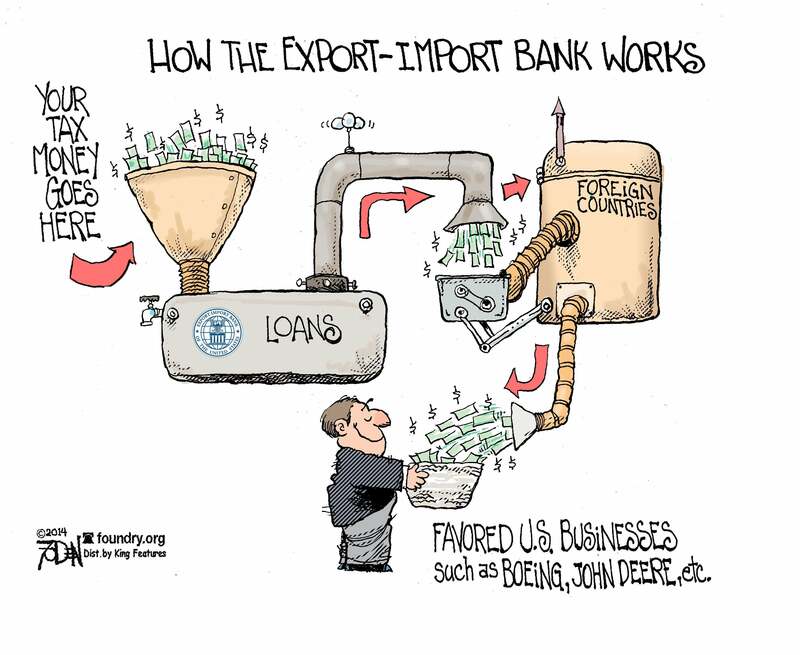 But the Export-Import Bank is just the tip of the iceberg. Politically connected corporations now treat Washington like a profit center, making “investments” in politicians in exchange for policies that unfairly tilt the economic playing field. Let’s look at another example of big companies suckling at the federal teat. Mark Calabria, one of my Cato colleagues (and we also both studied economics at George Mason University! ), explains why the federal government shouldn’t be in the business of helping rich shareholders by having the government subsidize corporate insurance policies. House Republicans and Senate Democrats are in the midst of negotiating a deal to extend the Terrorism Risk Insurance Act (TRIA), which expires at the end of this year. They should save themselves the trouble and protect the taxpayer by allowing TRIA to expire. TRIA is no more than corporate welfare wrapped up in the flag. …TRIA is simply a mechanism for allocating the losses from a terrorist attack. It does nothing to deter terrorists. Do we truly believe that terrorists say to each other, “Let’s not attack that building, it’s insured”? Under the best of circumstances, TRIA has zero impact on the cost of a terror attack. …Why are taxpayers thought to be better able to bear…risk than shareholders in publicly traded corporations, given the concentrated holdings of corporate equity? Why should middle-class taxpayers subsidize the 1 percent? I don’t want the federal government doing any redistribution, but it’s particularly upsetting when politicians and bureaucrats hurt ordinary people to line the pockets of the rich. Mark also explains that this isn’t simply a case of robbing Peter to subsidize Paul. As with many government programs, the indirect effects result in added collateral damage. It would be bad enough if TRIA simply redistributed losses from corporate America to taxpayers, but TRIA runs the risk of increasing the losses from terrorism. If developers faced the full cost of their design choices — say, that between a glass building façade or reinforced concrete – they would build safer structures. We’ve sadly seen this play out in the national flood-insurance program, where subsidies have encouraged poor construction while also encouraging families to live in harm’s way. Even the Congressional Budget Office has acknowledged that TRIA lessens the incentives to reduce losses from a terror attack. …the most important lesson of the financial crisis was that when you underprice risk, people make poor choices. That has been repeatedly demonstrated when Congress has attempted to hide the costs of certain activities, like subprime-mortgage lending. Similarly distorting the pricing of terrorism risk will also lead to poor choices. The final sentences are critically insightful. We need unfettered prices to ensure that costs and benefits are properly calculated and resources are productively allocated. The Wall Street Journal editorial page is similarly opposed to this example of corporate welfare. For proof of Ronald Reagan ’s maxim that the closest thing to eternal life on Earth is a government program, consider the Terrorism Risk Insurance Act of 2002. What was sold to the public as a temporary backstop is becoming another permanent entitlement. …Insurers and potential targets of terror, such as the National Football League, property developers and hoteliers, have lobbied hard to keep the program going, and going and going. Congress waved through extensions in 2005 and 2007. Earlier this year, facing a Dec. 31 expiration date, Harry Reid ’s Senate passed another seven-year extension 93-4. Like the Export-Import Bank, terrorism insurance is one of those business subsidies that both parties are only too happy to support. …The best solution would be for the House to let the program expire. Insurers have had 13 years to adjust their models. The Government Accountability Office reported in May that terrorism risk premiums have stabilized. …Private reinsurers can cover many of the risks that taxpayers now bear. By the way, I think private insurers and reinsurers were the best option, even immediately after the 9-11 terror attacks. Yes, the market was very unsettled and would have stayed that way for a while, but both insurers and customers would have had big incentives to quickly figure out the best pricing strategies. I would have much rather faced a year or two of instability rather than a decade-plus of distortionary subsidies. But that’s water under the bridge. What matters now is that there’s zero excuse for subsidizing the insurance policies of big corporations. By the way, just in case you think I’m exaggerating and that corporate welfare is limited to the Ex-Im Bank and terrorism insurance, check out these other examples of big business and big government conspiring against taxpayers and consumers. Look at the way the major pharmaceutical companies and big insurance companies got into bed with the White House to line their pockets via Obamacare. And examine how big financial firms pillaged taxpayers as part of the sleazy TARP bailout. 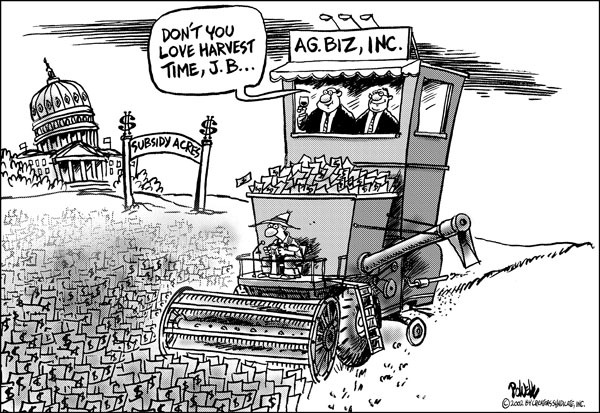 How about the way big agri-businesses rip off consumers with the ethanol scam. Don’t forget H&R Block is trying to get the IRS to drive competitors out of the market. Big Sugar also gets a sweet deal by investing in politicians. Another example is the way major electronics firms enriched themselves by getting Washington to ban incandescent light bulbs. Needless to say, we can’t overlook Obama’s corrupt green-energy programs that fattened the wallets of well-connected donors. And General Motors became Government Motors thanks to politicians fleecing ordinary Americans. P.S. Since our topic today dealt with terrorism, check out the terrorism-related humor and links in the “P.P.P.S.” of this post. P.P.S. New topic. Every so often I find some left-wing political satire that is genuinely clever and thoughtful. There’s my collection of anti-libertarian humor (including an article about libertarian law enforcement), some good leftist tax cartoons, a Fox News dystopia, and some well-done first-world vs third-world imagery. 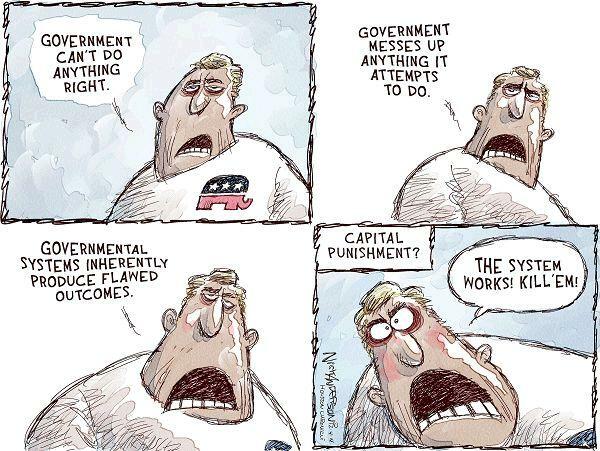 Now we can add this cartoon about a Joe GOP Sixpack who thinks government is grossly incompetent and untrustworthy, with one exception. A very effective zinger, I’ll be the first to admit. Indeed, the cartoonist hits me in a somewhat sensitive spot.